Welcome to the ST division blog! The Solar-Terrestrial (ST) Division of European Geosciences Union (EGU) is starting its own blog! The blog is an initiative by a group of enthusiasts who met during the EGU’s General Assembly in April 2017. We are thrilled to set up this blog that will keep our readers informed about a range of topics relevant to the science of the division. A CME from the Sun heading towards the Earth. Thanks to the magnetic field enveloping the Earth, we stay protected from the wrath of the Sun. The influence of the Sun on the Earth and our planetary system have shaped a dynamic, constantly evolving scientific area. 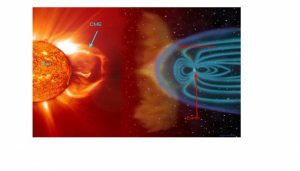 The Earth’s atmosphere, ionosphere and magnetosphere are strongly moulded by the Sun, solar wind and galactic cosmic rays. We have an armada of spacecrafts and detectors on the ground to record solar eruptive events and their in-situ manifestations. This helps us study the ST sciences. The Sun fosters life on Earth and acts as the vitalizer of our very existence. However, it spews large amounts of plasma and energy towards the Earth that can hinder day-to-day life in modern society. Space weather and terrestrial weather are continually influenced by small changes in solar output, which not only varies from day to day but also through longer timescales throughout its lifetime. Studying the Sun and its effects on the near-Earth environment can facilitate more accurate predictions of space and terrestrial weather. Such forecasting can in turn help keep life on this planet safe by having early warning systems. Research in the ST sciences is very stimulating for us and we wish to share our enthusiasm with our readers. Bringing science to the public is the intent of this blog. Students as well as early career scientists (ECS) will greatly benefit from the broad nature of topics that will be discussed here. Getting everyone excited about science in general and ST studies in particular is our aim. We will discuss papers in the “spotlight” to look at the recent breakthroughs in this field. There will be articles and interviews of featured scientists to discuss post-doc life, career path or alternative careers. As well as exciting scientific topics we will also provide informative general highlights and timely deadlines for conferences. From time-to-time our own EGU-ST ECS representative (Jone Reistad) will discuss ECS related opportunities and problems. All in all, this will be a voice for scientists to reach out to the community. We have planned an extensive series of blogs from our team of experts and other scientists (especially ECSs and students). We encourage guest bloggers to contact the editor. Come back every month for a new and informative blog post.